Have you ever had a dream in life? Ever get so excited about an opportunity only to have someone else tell you why it will not work? Robert Fitzgibbons knows this story. So does his creator, Eric Blank. Both spent more time listening to others than listening to themselves. The voice inside was always there telling them what to do yet they were both too distracted by everyone else’s wishes and desires. As a result of his life experience, Eric offers the powerful message of following your dreams. 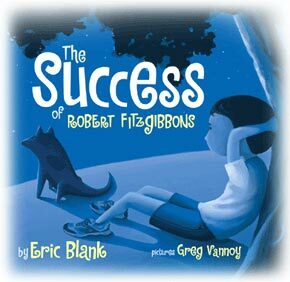 The Success of Robert Fitzgibbons illustrates how one young boy experiences the difficulties of not following his dreams. Through his journey, Robert Fitzgibbons shows that it is never too late to follow your heart and to achieve happiness – the ultimate success. Eric Blank creates a simple yet deeply profound tale entertaining and motivating readers of all ages. The powerful “follow your dreams” message revives our own dreams and reminds us of life’s amazing possibilities. This contemporary story is written with imaginative rhyme and lively illustrations inspired by drawings created by elementary school students. The Success of Robert Fitzgibbons is a ‘must read’ addition to any child or adult’s collection. This book will inspire your entire family. Eric is spreading this message to the world through his book and his lectures. Click here to learn more about The Success of Robert Fitzgibbons. Click here to learn more about Eric. "The Success of Robert Fitzgibbons is a wonderful parable about following your heart and dedicating your life to the pursuit of your dream! Read it and apply its timeless lessons." of The Courage to Succeed.